← Should Holocaust denier David Irving be barred from Auschwitz? After noticing that the Iran’s English-language news agency Press TV has been promulgating a modern version of the blood libel by alleging that Jews kill children to harvest their organs, I started digging a bit deeper into Press TV’s articles and broadcasts. I have found some more very disturbing things. This will be the first in a series of posts describing Press TV’s practice of using American anti-Semitic ideologues as expert commentators. 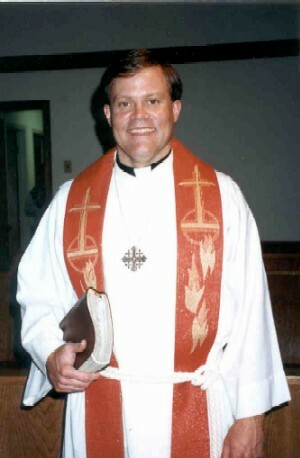 Today let’s focus on Mark Dankof, a Texas-based anti-Semitic podcaster and Lutheran pastor, who was interviewed by Press TV’s Waqar Rizvi on September 11, 2010. Dankof spent a couple of minutes comparing 9/11 to the JFK assassination. Both cases, he claimed, have given rise to “conspiracy theories that are legitimate…and are based upon very solid data.” I was wondering why he went into such detail about the JFK issue, but later found that it is a recurring focus of Dankof’s: and he believes that the Mossad was responsible. Dankof complained about the American Jewish Congress. Dankof plugged his website and specifically the links section, where he said he links out to scientific analysis of the destruction of the World Trade Center. Check it out for yourselves, though, and you’ll see that he also has prominent links to a whole bunch of our other friends, including: David Duke; anti-Semitic website aljazeerah.info (not the same as the famous Al Jazeera network); traditionalist Catholic anti-Semite E. Michael Jones; the Holocaust-denying Institute for Historical Review; Michael Collins Piper; and Brother Nathanael Kapner of “wicked wicked wicked Jews” fame (click here; the good stuff starts around 40 minutes in). Dankof made sure to hit the anti-Zionist conspiracy theory trifecta, devoting his final minutes to the USS Liberty Affair, the Jonathan Pollard case, and the Lavon Affair. I had not heard of Dankof before, so I did some more research about him. It wasn’t hard: he is a co-host of a rabidly anti-Semitic internet radio show called “The Ugly Truth,” and has a significant web presence going back years. On a podcast from September 7, just days before his Press TV interview, Dankof said that Israel is conducting “black operations…against the people and government of the United States”; that Israel “owns” congress, the president, and “a large number of chief executives in this country”; and that “Zionism and the Jewish lobby” are responsible for US unemployment and “cultural degeneracy.” In this podcast he also cited Willis Carto favorably. Before he got involved with The Ugly Truth, Dankof had his own internet radio show on the Republic Broadcasting Network. On a January 3, 2010 podcast of the show, Dankof blamed Jews for a variety of social developments that he opposes. In one notable quote Dankof said, “Jewish fingerprints are all over the homosexual rights movement in the US as well as internationally. Search this on Google and see if I’m not right, folks….Take a look at some of the things that David Duke has written about this, as well as some other people online, and you’ll see exactly what I’m talking about.” Dankof also bemoaned “disproportionate Jewish and Zionist influence through the US and worldwide.” On other episodes of his show he interviewed David Duke and other noted anti-Semites and white supremacists. Anyone who wants to do more research on Dankof can start with an old bio of his that’s still posted on the site of his old radio show. The bottom line here is that Press TV approached a man with a clear record as an anti-Semitic and anti-Israel ideologue and interviewed him on a show about 9/11. Dankof tried to keep his anti-Semitism off the air, but his conspiratorial anti-Israel beliefs came through clearly. How can Press TV even pretend to be an agency of careful journalism when they pull stunts like this? This entry was posted in Anti-Semitism, Anti-Zionism, David Duke, Iran, Mark Dankof, Press TV. Bookmark the permalink. Pingback: Über die Kooperation zwischen PressTV und amerikanischen Antisemiten « FREE IRAN NOW! Pingback: Über die Kooperation von PressTV mit amerikanischen Antisemiten « FREE IRAN NOW! Pingback: Über die Kooperation amerikanischer Antisemiten mit PressTV « FREE IRAN NOW! 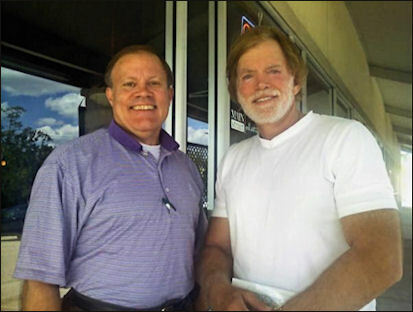 Dankof picturing himself with a former Klan leader….that really shows where he resides, he’s a bigot and a hatemonger. And yet Iran’s PressTV does not mind to allow him on as a “commentator”. If you don´t like “anti-semitism” then you should be working very hard to clean up the corruption in the “jewish” religion. After all, jews are being arrested in the US for illegal organ trading – to the point where Congressional committes investigate that corruption. Apart from organ trading, you could also begin chucking out all the “israel-first” corruption associated with “jewish” gambling mafias andtheir support of terrorism. Then work on all the corrupt, abusive “jewish” financial oligarchy. How many times will jews have to pay for the abuse of the “chosen ones” by “schlepping”, “haciendo las maletas”, ….. Aren’t you smart enough as a group to clean up those that repeatedly cause you disasters? You do know that the abuse in anglo-saxon countries is producing the next round? Racist minorities that abuse the majority population are detested everywhere. Jewry is the Globalist Anti Christ of all humanity and cultures. 9/11 was a demolition done by Israel and Zionist Traitors, the planes were just a distraction for dupes and idiots. The laughable Holocaust is Communist Jew war propaganda as there were zero gas chambers and about 150k nasty Jews who died from typhoid, war and starvation at the end as the allies destroyed all food and means of travel. 109 times the putrid Jew has had to be removed from territory after territory. Biology is real and the Jew just happens to be the parasitical sickness of the human species. ‘dos po’ lil joos. They never do nuttin’ (if you don’t count vicious lying/libel, murdering tens of millions of White Europeans & Arabs, being the founders of Black slavery, USURY USURY USURY, the polluting of NEARLY EVERY LAW, the polluting of the medical system, the polluting of the educational system, STEALING SO MUCH THAT THE 98% WANT JEWS DEAD, polluting the entire culture by their 99.6% control of the media, White slavery in Israel, organ harvesting in Israhell, the LIST IS ENDLESS. But dem po’ jeeeeews. There just ain’t any reasons they’ve been kicked out of every country they’ve ever lived in. Where will they go for the 110th ousting? Better find a new solar system, World Jeeeewry.